Christmas at SeaWorld Orlando - Holiday shows, dining with Santa, and more! In my series about a Christmas theme park day that actually feels like Christmas and not just like a day at the theme parks (as awesome as that can be! ), don’t forget about SeaWorld! Having said that, let me just admit here that I have conflicted feelings when it comes to parks like SeaWorld because the experience that gave me such an awe and a respect for magnificent creatures like Orcas (killer whales) was my childhood visit to a similar park called Marineland, in Canada. It changed me forever and made me conscious of the need to protect the oceans. On the other hand, I don’t honestly believe the pools at the park are sufficient for a creature the size of an Orca and I followed the attempt to reintroduce Keiko, the whale from the movie Free Willy, to the wild, and that was not a success story; click here to read more about Keiko. SeaWorld has announced that they are discontinuing their Orca breeding program and they engage in animal rescue and rehabilitation programs so, to that end, I am at an uneasy peace with the reality that we have a responsibility to care for the orcas already in captivity for the duration of their lives and for my tourist dollars to contribute to that care. Your conscience may lead you to boycott this type of park and I respect that decision too. Now, back to Christmas! SeaWorld is typically much less crowded that the Disney World and Universal Orlando parks which have a special “holiday crowd” designation which means “worst crowds imaginable” – this breathing space alone may feel like a gift from Santa but this beautiful park brings a lot more great experiences to the Christmas guest. There are rides, including a couple of really exciting roller coasters, but that wouldn’t be my top priority for an experience that gives me warm and fuzzy Christmas feelings. Clyde & Seamore’s Countdown to Christmas features two absolutely adorable and somewhat mischievous sea lions. Elmo’s Christmas Wish is geared towards young children and features Elmo, Rosita, Grover, Zoe and Cookie Monster, the beloved stars of the long running children’s program Sesame Street. Shamu Christmas Miracle which lets you experience seasonal music and see beautiful killer whales (orcas) in motion. Winter Wonderland on Ice has holiday skaters and fountains of water. O Wondrous Night is a beautiful live Nativity production with over 30 Christmas carols, life-size puppets and live animals. SeaWorld at Christmas - Sea of Trees waterfront area and firepit. The fact that you are in Florida doesn’t mean that a snowy winter wonderland isn’t essential for a proper Christmas celebration. SeaWorld gets that and they’ve got it covered with their Sea of 100 Trees that sparkle to music and light up the water; there is the lakeside Gazebo Stage featuring live musical performances. They also have artificial snow flurries near the Shoppes at Waterfront. There is a Christmas market where you can buy holiday kettle corn, waffle cone S’mores, stuffed donuts, hot cocoa or even sample a seasonal craft brew to enjoy near the warm glow of the fire pit. My Christmas trip to SeaWorld would also include visits to their Antarctica: Empire of the Penguin and Wild Arctic rides and habitat areas because we all know that penguins, walruses, and snowy white beluga whales are the critters that live near Santa Claus’s place. Christmas at SeaWorld: Meet udolph, Clarice, Bumble and Yukon Cornelius from the classic Christmas Rudolph, the Red Nosed Reindeer television special. 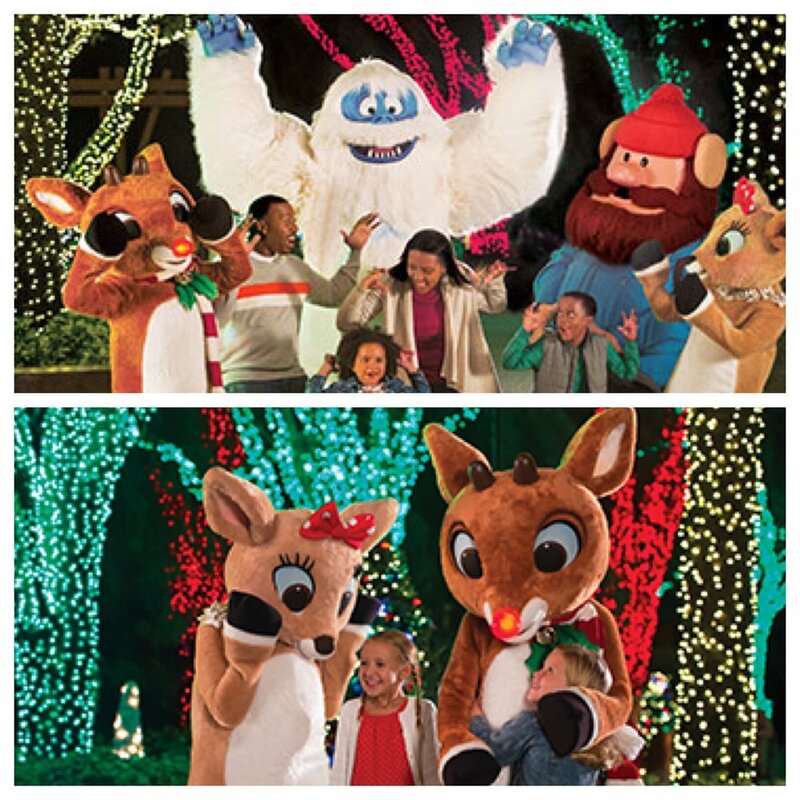 I would definitely want to get photos of my family at Rudolph’s ChristmasTown where you can meet Rudolph, Clarice, Bumble and Yukon Cornelius from the classic Christmas Rudolph, the Red Nosed Reindeer television special. For a memorable holiday meal, there is Dine with Santa at Shamu Stadium, prices start at $28 per person age 10 and older and $14 for children ages 3-9 when you book your reservation for November 17, 18, 23, 24, 25, December 1, 2, 8, 9, 14, 15, 16, 21, 22, 23, 24, 2018. Where I would stay: SeaWorld doesn’t have any onsite hotels but they do partner with several nearby hotels and they are offering a Christmas package that includes stays at select hotels for stays from November 15 –December 25, 2018. Example hotels: SeaWorld area Residence Inn, Fairfield Inn & Suties, SpringHill Suites, Residence Orlando, Hilton Orlando, and Blue Heron Beach Resort. Reserved seating at all of SeaWorld’s Signature shows, including the Christmas shows. This package may not be the absolutely cheapest way to visit SeaWorld but it offers a lot of conveniences that are really helpful in having a great Christmas experience when crowds are higher, things like complimentary shuttle service from the hotel, Quick-Queue front-of-the-line ride access (once per ride) for select rides, an animal rescue tour, and a 10% discount on merchandise at select locations. Even if you’re not interested in a package, you can easily add a SeaWorld day to your Orlando vacation and there are reserved seating packages for Clyde and Seamore’s Countdown to Christmas, Winter Wonderland on Ice, O Wondrous Night and Shamu Christmas Miracles on sale for just $20 per person above the cost of your regular admission SeaWorld ticket for select dates from November 17 to December 24th. You don’t have to buy a reserved seating package to enjoy these shows – this just saves your having to wait in line. You work really hard to carve out the time and money for a vacation and you want a great experience in the moment and wonderful memories in the future but, there are so many options and so much information, as well as misinformation, out there that the planning process can go from fun to frustrating in a hurry. You need one of our vacation planning experts in your corner because they’ll work with you from start to finish who understands your priorities and who wants to see you have a great trip. Doesn’t that sound a lot better than trying to figure it all out alone? The best part is that we book directly through SeaWorld, Disney and Universal for your protection and we are fee-free when you book through us which means that you can get all of the help we have to offer without having to pay any extra. How is this possible? We are a traditional travel agency so we are not employees of SeaWorld, Disney or Universal but we do get paid by them making it a win-win for everyone. Just let us know if you have any questions about our services – we are happy to give you all the information you want and need so that you can feel good about trusting us to help you have a wonderful and memorable vacation.